To move around or simply to clear the rear wheel from a tricky zone and reposition your bike, you must be able to balance and pivot on the front wheel pretty much on-demand. Control the whole momentum with your torso. 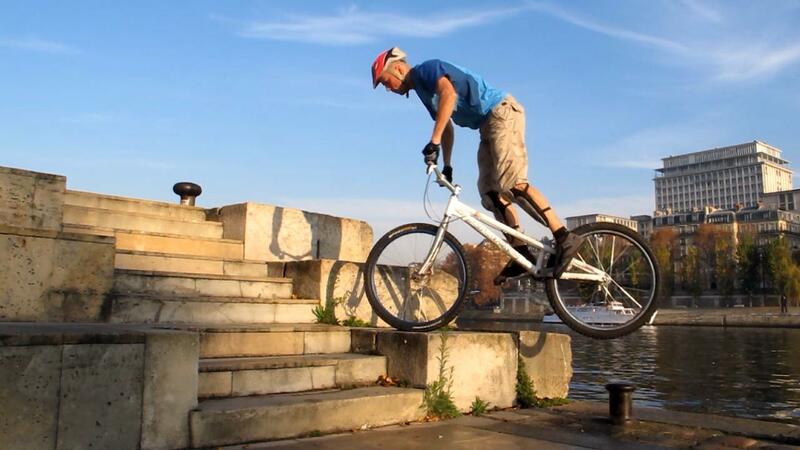 Tuck your knees to let the rear wheel go up. Riding at a slow pace, apply the front brake to a full stop. As the bike stops, stay supple and keep your torso moving forward until your shoulders come well above the handlebars, maintain your arms straight. Maintain your momentum until you can't keep going, then push on the handlebars with your arms fully stretched. At this stage, your weight should be mainly above the stem. Pushing on the handlebars and tucking your knees will rock the bike on its front wheel. Adjust your posture to control your balance and the rate at which the bike tilts. To stop the move and lower the rear wheel again, move your hips further back from the stem. 1° Riding at a slow pace, apply the front brake to a full stop. 2° As the bike stops, stay supple and keep your torso moving forward. 3° Maintain your arms straight and let your shoulders come well above the handlebars. 4° Going on your momentum, push on the handlebars with your arms fully stretched. 5° Pushing on the handlebars and tucking your knees will rock the bike on its front wheel. 6° Move your hips further back from the stem to stop the motion and lower the rear wheel again, . 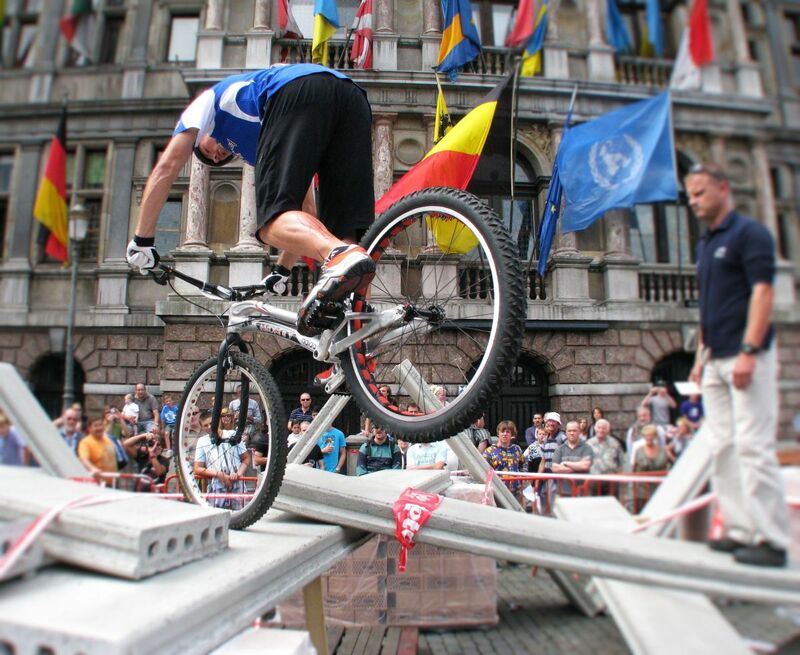 Don't go too fast or your inertia will send your right over the bars when you block the front wheel. Remember this is about balance, not about crash speed. 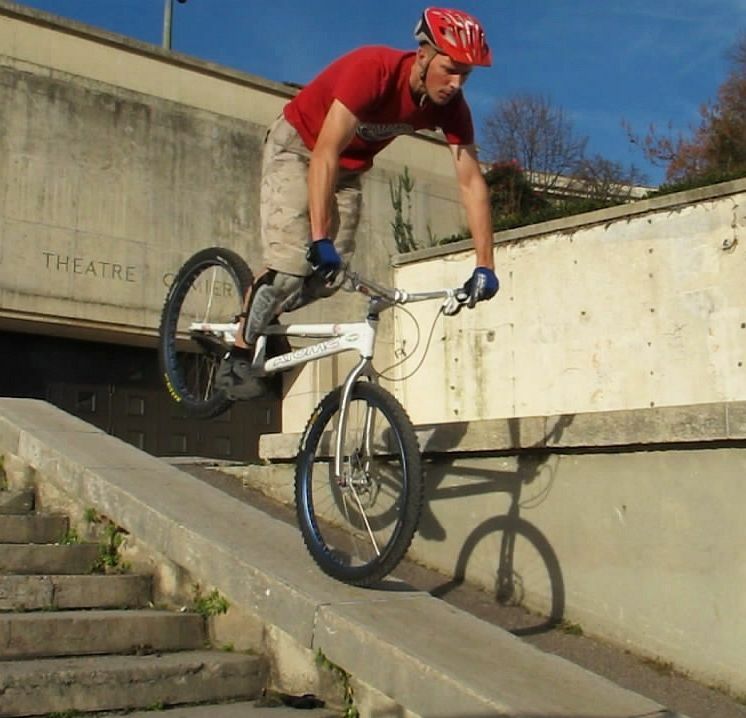 If things go wrong (going over the bars), don't release the front brake but instead just drop your feet on each side of the front wheel to stop the move. 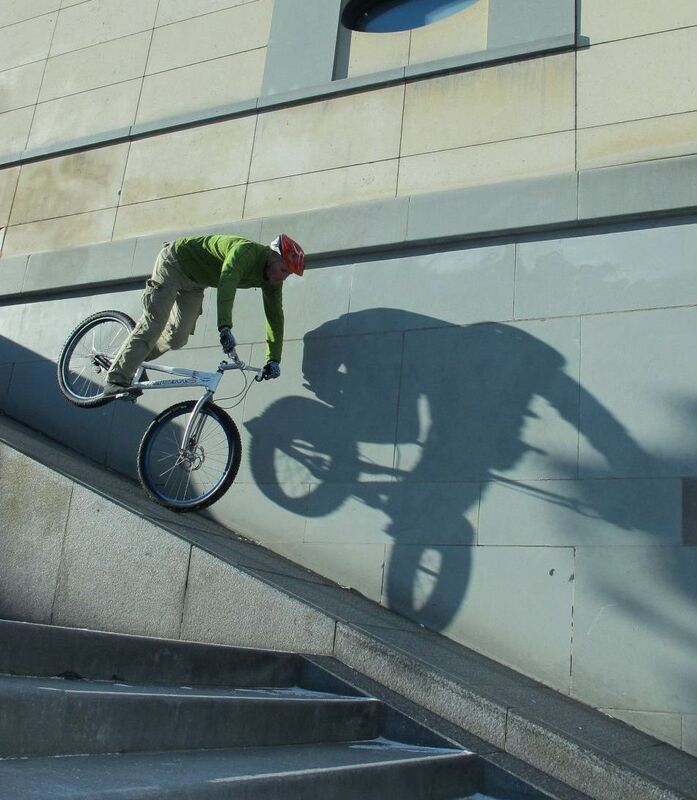 Alternatively, jump over the bars, let the bike go and land safely on your feet. 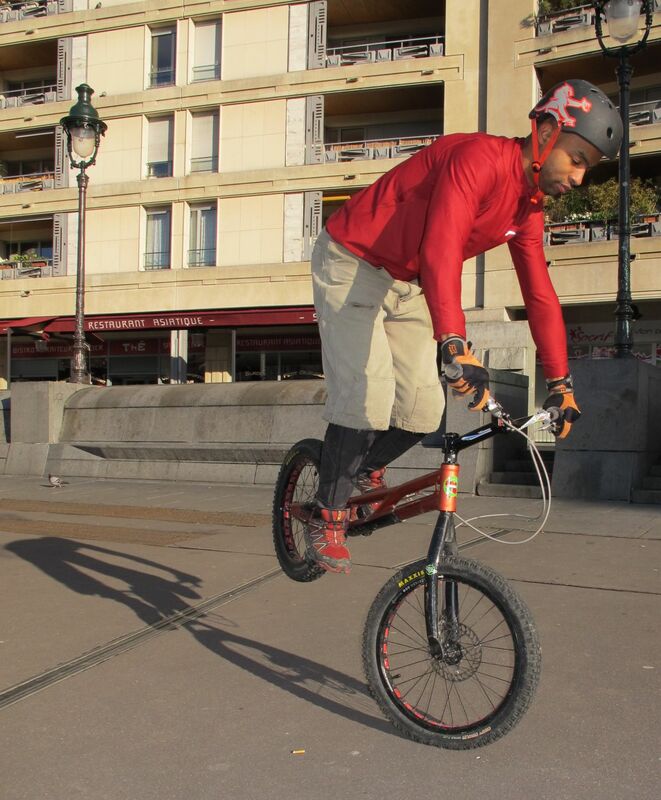 Riding on the front wheel With practice, you can use your momentum to ride well balanced over the front wheel. Before you reach a complete stop, release the front brake very slightly to let the front wheel roll smoothly as you push the bike in front of you. Benito Ros tilts the bike on its front wheel. Kenny Belaey clears his rear wheel. Make sure to transfer enough momentum forward before you release the front brake, otherwise the rear wheel won't take-off. If you have enough room in front of you, riding on the front wheel can be one of the safest and most efficient transitions to bring both wheels onto the same level. It is also very energy efficient as you don't have to jump. Often, you only have to maintain your balance for a fraction of a second to clear the rear wheel away from a difficult section or until the rear tyre gets a good grip. Although this works best in straight horizontal moves, you can also swing the rear wheel to reposition it sideways while the front wheel rolls. 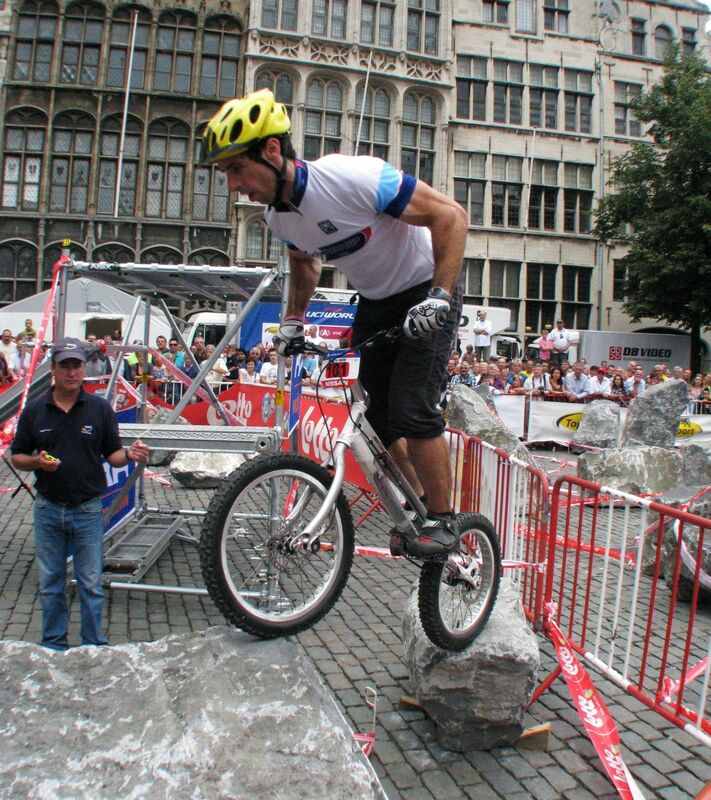 Starting with the front wheel positioned higher onto an obstacle, you can tilt the bike over the front tyre and then release the front brake to finish with both wheels level. 1° Regroup over the bike to prepare for an impulse. 2° Surge to create momentum and throw your shoulders forward. 3° Push on the handlebars with your arms to lift the rear wheel up. 4° Then release the front brake to roll forward, both wheels level on the obstacle. 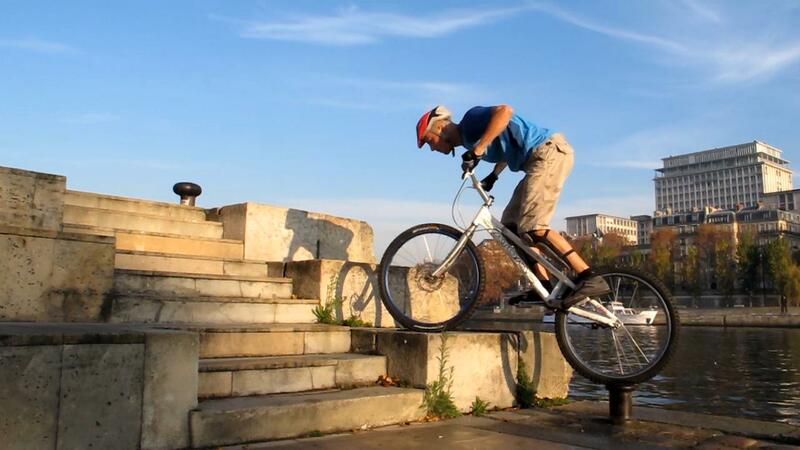 Nose wheelies add fun to any street session. 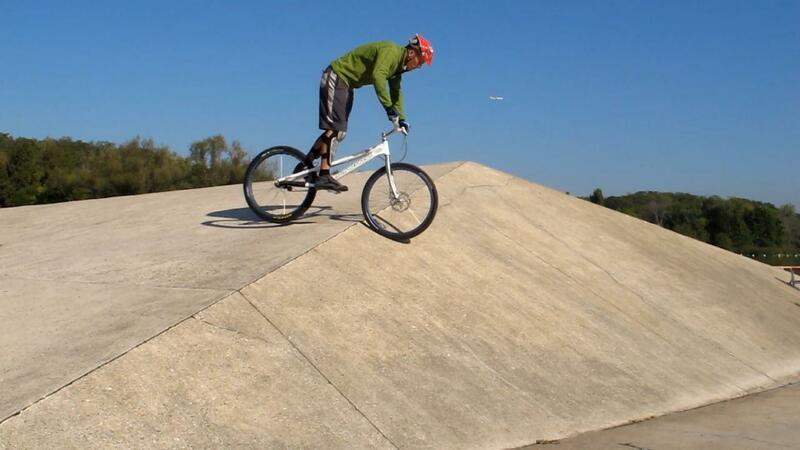 Down a slope, gravity takes over your initial momentum so you can ride down for as long as you are able to maintain your balance over the front wheel. Unlock the front wheel but feather the front brake to control your speed. 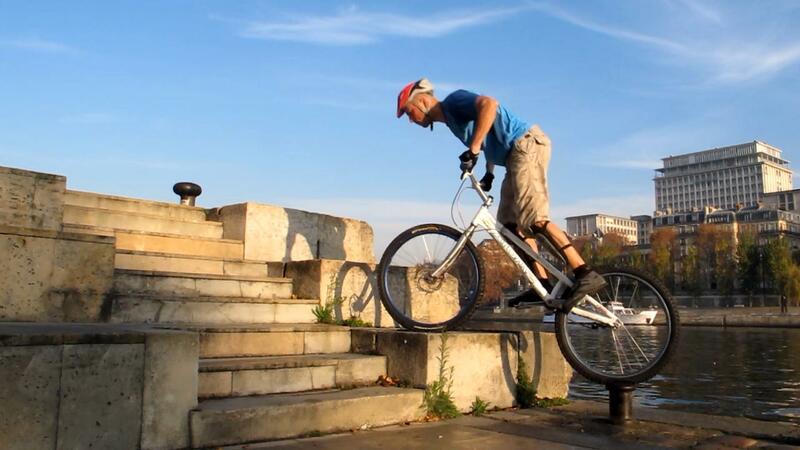 You don't have to lean so much over the bars to lift the rear wheel so don't overdo it or you will fall over. 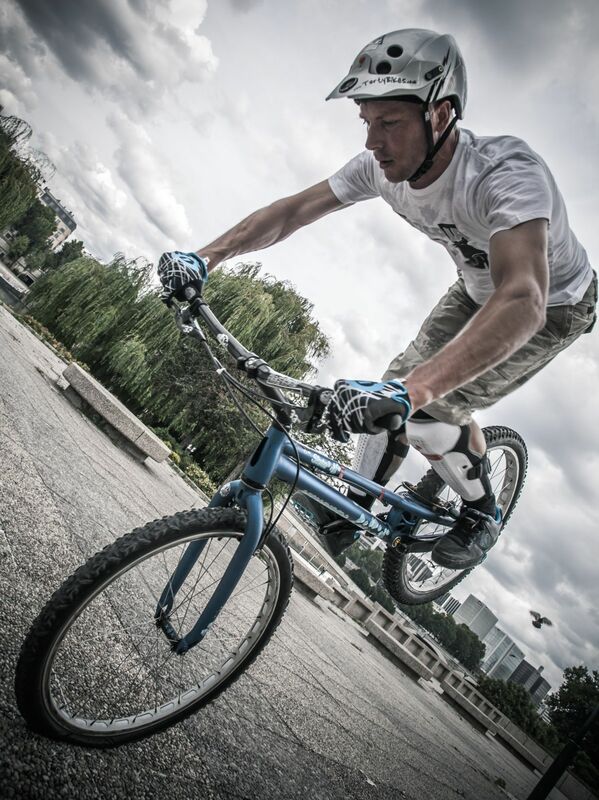 You must constantly adjust your posture to maintain your centre of gravity right above the front hub. If the bike tilts too much forward, release just enough grip from the front brake to let the rear wheel drop down again. 2° As the bike stops on its front wheel, stay supple and keep your torso moving. 3° Let the bike tilt on its front wheel as you lean further over the stem. 4° Unlock the front wheel but feather the front brake to control your speed.